Like most Silverlight controls, the RadExpander also allows you to template it in order to change the control from the inside. This section will explain the structure of the RadExpander's template. Here is a snapshot of the template generated in Expression Blend. [Grid] - is of type Grid and represents the layout root for the template. [Border] - hosts the RadExpander and is of type Border . 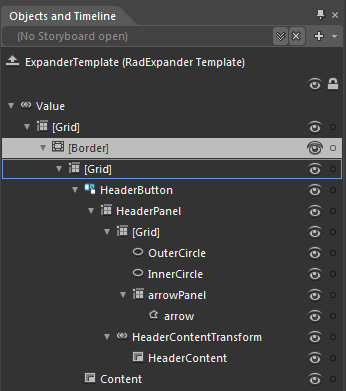 [Grid] - represents the host control for the RadExpander 's template elements. HeaderButton - is of type RadToggleButton and represents the control that holds the Header of the RadExpander . HeaderContent - is of type ContentPresenter and is used to display the value of the RadExpander.Header property. Content - is of type ContentPresenter and is used to display the value of the RadExpander.Content property.